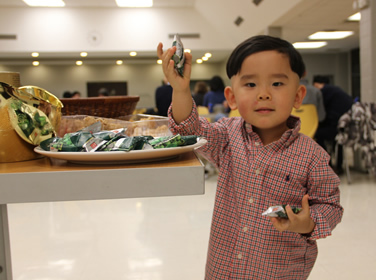 Tuesday night, the tight-knit community of Chinese families whose commitment to education and to their children has led them to Bullis, gathered for a Chinese New Year's feast, What an honor it is to be part of the Bullis community together. While more than a dozen Chinese students weren't there because they were practicing for the play, rock climbing, or competing in other sports, the group that gathered was large and festive. After four students sang a Chinese song, Head of School Dr. Boarman welcomed everyone. Several parents spoke of the strong academics, college matriculation, and close student-teacher relationships as reasons that they love Bullis and are grateful for the academic opportunities it has given their children. The parents spoke in Chinese, and the students translated.